The hermit blessed the Maharana and advised him to build a palace at this favorable located spot with a fertile valley watered by the stream, a lake,an agreeable altitude and an ampitheatre of low mountains. Maharana followed the advise of the hermit and founded the city in 1559 A.D.
Overlooking the aquamarine expanses of the Lake Pichhola stands the splendid City Palace-a marvel in granite and marble. Of the original eleven gates of the Udaipur City,only five remain. The Suraj Pol the original or Sun Gate on the eastern side is the main entrance to the city. 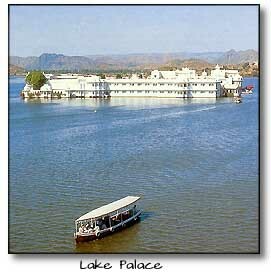 Exquisite lake palaces of Udaipur shimmering like jewels on Lake Pichhola are overwhelming in splendor. Several places of interest around Udaipur, including the majestic Chittaurgarh,the mountain fortress of Kumbhalgarh, beautiful jain temple of Ranakpur,Ekligji and Nathdwara and the cool retreat of Mt. Abu, make the visit to Udaipur a memorable one.